Things have been slowing heating up in the bus lately, but luckily once it hit it's boiling point, we've been able to cool down and get things back to comfortable. While I hate things going bad, it does usually result in things getting better...and for that, I'm grateful. Last week our little vegetarian turned nine, and also completed a whole year without eating meat. He has no plans to ever eat meat again, and he's finally begun liking beans. I know they're not the only source of protein, but I know it's a good one, and one that we have often and just makes me feel more secure that he's getting enough "good" stuff. Which is crazy really, because he eats more greens than anyone else in the house, and he's the only kid of ours that doesn't look like a toothpick. I'm a mom...I get to worry. It says so some where. My mom always sends a box of presents for the birthday kid, and small things for the other kids, so we rarely (if ever) give presents ourselves...we like to take them to do something fun with the family, so on his birthday we told him we'd do whatever he wanted on Sunday, Dad's day off. Last year he got his ears pierced and this year he says, "Get a tattoo!" We're liberal...but not THAT liberal. I throw out: White water rafting on the Colorado River? Tubing on a tame portion of river? Train ride through the Rockies? 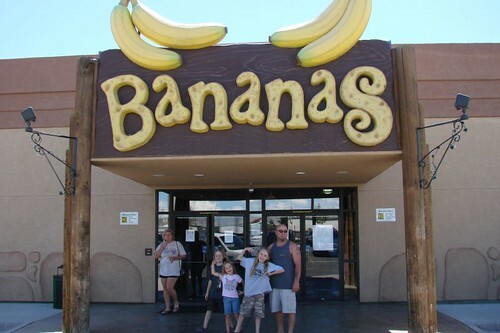 All of those being my first choice, but no, he wants to go Bananas! At first I decided against taking my camera because I wanted to be free, but last minute I grabbed my old (smaller, with video) camera, and as usual, was glad I did. 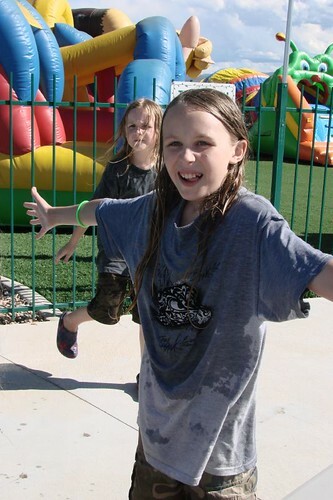 First thing we did was the bumper boats, and second thing we did was get SOAKED! 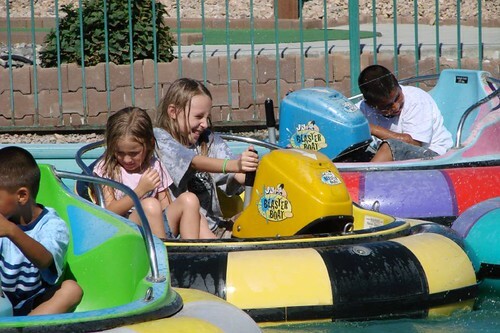 These were not the old bumper boats from my day, these had squirt guns on them and if there was an adult in a boat, every single kid attacked said adult. Luckily it was hot out, so we dried in about three minutes. Other than the bumper boats and arcades, there wasn't much else for us parents to do, though. Well, besides the mini golf, but that wasn't happening in ninety four degree weather. We had a great time watching the boys on the go karts, Jewel on the inflatable playground, winning mucho tickets in the arcade, killing each other at lazer tag, and relying on the bumper guards in mini bowling. 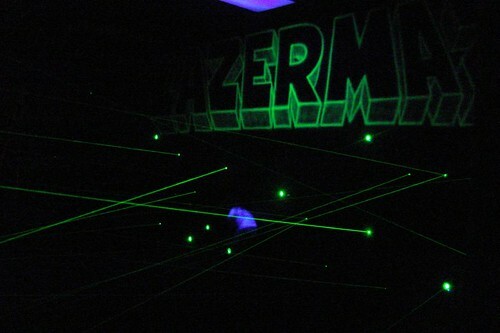 The highlight for all the kids though, was the lazer maze. The picture doesn't do it justice, but it was hundreds of colored lights that they had to maneuver by rolling, crawling, jumping, contorting...all without hitting the lazers. Jewel's the white dot trying to duck under one. She only hit one lazer, and I think had the best time. That's my girl. We topped off the day with blizzards from DQ. The very next morning Jewel's asking to go Bananas again. I'm half way there. I asked Jewel these questions that I stole from Christy, but the boys were chipping in their own answers, too. 1. What is something that Mom always says to you? ummm..how old are you? 25! 9. What does your Mom do when you are not around? shopping! Jonas says, "not remembering"
16. If your Mom were a cartoon character who would she be? Jonas says, "Jessica Simpson"(I'm pretty sure he meant Lisa Simpson, but I'll happily take Jessica)..Jake says "Betty Boop"
20. How do you know that your Mom loves you? 1. What is something that Dad always says to you? go to work..Jonas says, "to spend time with us"
9. What does your Dad do when you are not around? 10. If your Dad becomes famous what will it be for? Welding!.. Jake says: Making money! 12. What is your Dad not really good at? 13. What does your Dad do for his Job? 14. What is your Dad's favorite food? 16. If your Dad were a cartoon character who would he be? 20. How do you know that your Dad loves you? ....You may actually have people who read it. Last week while Joey was at work (back on the pipeline) there was a knock at the bus door. When I opened it, in my JAMMIES, a couple was standing there and introduced themselves as Tom and Nancy from Florida, and said that he has actually been reading my blog for a couple years!! I was shocked, first because I didn't think anyone other than unschooling mom's read it, and secondly because he found us! They were traveling in Colorado in their RV and after reading my last post about Rifle Falls State Park, decided to check it out. Third shock, is someone actually LISTENED to me! He may not have actually listened, but he liked my photos enough to have to see it for himself. He tried swimming in the creek like our kids but determined they were Superkids with an unnatural liking to glacier water. For some reason I wasn't freaked out AT ALL. I probably should have been, but they were such a nice couple, have a Bluebird bus of their own, although theirs is a Wanderlodge, not a wanna-be...plus they wanted to take us out to dinner. How could we NOT like them? When Joey got home we swam in the lake with them, while Nancy kept a keen eye out for gators, being from Florida and all, but what she really had to watch out for were the biting fish....and bite they did. Right after I bragged how I've never been bit by one, I had one try to rip a mole off my chest. Ooo, it still hurts just thinking about it. They treated us to fried pickles, huge burgers and pizza at the local bar and grill, and since the RV park was full they headed on down the road after supper. They've invited us to their lake house in Florida whre they plan on turning our kids into waterskiers....we can't wait! Now I'm wondering who else reads this that I don't know about? Can I have a roll call, please? A simple, "I do" will be fine. Thanks!